Race-Post-Brexit – Black political elites bristle with intent, but can they deliver? 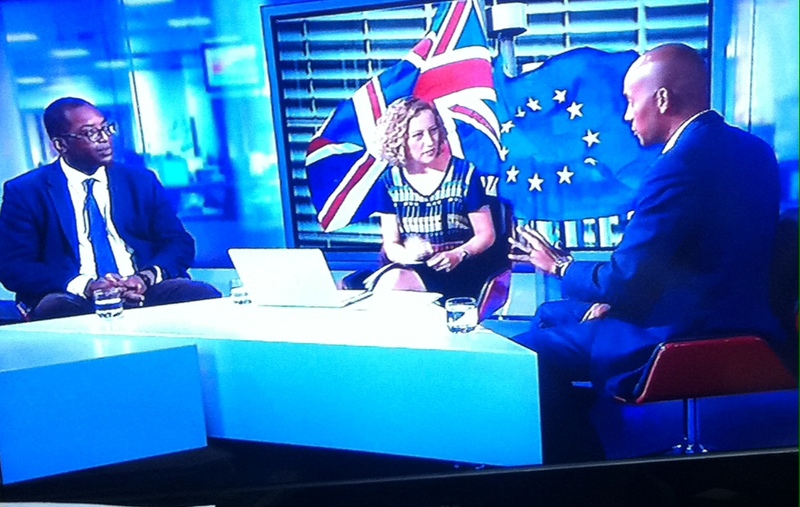 In all the post-Brexit bloodletting, opposing Black political elites Chuka Umunna and Kwasi Kwarteng went head-to-head on the Channel 4 News with Cathy Newman. Exit-eer advocate Kwarteng, Conservative MP for the 90% white and leafy Spelthorne, battled for the “Better times to come”. Ditching the European Union secures a renascent Britain of free trading and soaring economic progress, he said. In contrast, the free market orthodoxy is a costly choice for unprotected workers and vulnerable social groups, said the remainer Umunna, Labour MP for Streatham, home to many Caribbeans and Africans. Of Nigerian British heritage, he chairs Vote Leave Watch “the grassroots campaign to hold Brexit leaders to account for their overblown promises”. Whether you are in one camp or another or “don’t know”, beleaguered Black voters and communities risk exclusion. Post-Brexit, they must embed their civil rights ideas in public policy and party politics. 1. Black voters should be watchdogs, not lap dogs. They must raise the alarm against post-Brexit rhetoric and media manipulation of popular prejudices. This means monitoring and exposing the Conservative government’s hastily proposed race audits and party political “Get Blacks on Board” campaigns. The Tories have staked a claim as the “the party of Britain’s ethnic minority voters”. Tory Asian big hitter Sajid Javid, the new Communities cabinet secretary, leads the Modern Britain call for a “black and minority ethnic manifesto”. Labour’s London Mayor Sadiq Khan, himself of Asian heritage, installed a bi-racial tsar for “social integration of racial minorities”. The political elites bristle with intent. Nevertheless, the challenge is self-evident. Why? Because it’s widely recognised that no party or government can claim a democratic mandate while failing to attract Black and minority ethnic support. Yet, the strategies are dangerously devoid of Black voter participation, leaders and community control – a glaring exclusion in one of the world’s most densely populated multiracial and culturally diverse capitals. Xenophobic and race related hate crimes are deplorable. Notably, the UK Equal and Human Rights Commission report condemned the dangerous rise of attacks spurred by the deeply polarised EU referendum vote. Promoting the safety and well-being of children in school and on the streets is urgent. Parents and teachers must address the long-term effects of Brexit-fuelled abuse. Teaching children the A B Cs of racial literacy is essential. These include awareness of danger, building love of self and community and countering prejudices and negative stereotypes. 3, Get The Facts! Debate the pros and cons of Brexit.Fact-gathering organisations are essential allies. Black legal, police associations and research experts are the sorely needed friends in court and parliamentary advisors. Prominent democracy advocates are a boon. They can help marginalised and vulnerable communities assert their rights. Why do anything you might ask. Because reason and vigilance are the essential danger-limitation strategies in the cut and thrust of post-Brexitism. Evidence shows that white privilege restricts Black life chances in many sectors of society. Once demonised themselves, people of colour have a firm antipathy towards all UK restrictions on freedom of movement. Equally, they reject all forms of “aggressive nationalism” and “crude populism”. Therefore, they must use their knowledge and experience to defeat ignorance and baseless fear of strangers. They know that every human rights declaration supports this view. The earliest is the Universal Declaration of Human Rights(UDHR) adopted by the United Nations Assembly in 1948. Witness the Treaty of London 1949 that founded the Council of Europe. Furthermore, the UK Human Rights Act 1998 and the Equality Act 2010 outlawed discrimination on the grounds of race and religion, among other issues. The heated Brexit encounter of opposing Black political elites on national television may be more important than we think. Experts say leaving the EU will surely weaken development initiatives in vulnerable African, Asian and Caribbean countries. This means lost existing preferences and £hundreds of millions in export duties, according to the distinguished Commonwealth Secretariat series Trade Hot Topics. Hence, the urgent need to ensure UK’s new found trade policy sovereignty reverses the trends. Brexit must improve economic recovery in the colonies and client states. Furthermore, advocates say £30 billions of extra funding will help to increase food production, education and health services in the poorest countries. Inevitably, Brexit heightened the conflicting claims of UK minorities to scarce public and private resources. It’s each for themselves and fierce competition with all others. Thus, Blacks, who are perhaps the weakest of all national groupings – by race, religion, age, gender, class, nationality and region – have to work harder to move up the queue. Basic tactics include mobilising communities, communication skills, capital and confidence. To level the playing field, they must urge government to prepare guidance for fair play rules, regulations and mediation. As a result, Black political elites, voters and communities may gain a place in the key post-Brexit sectors of influence: public policy and party politics. This ends the Brexit series by Thomas L Blair available on Chronicleworld.wordpress.com. Your views and comments are welcome. Please share them with your followers on social media, Facebook and Twitter.